This entry was posted in 1940's, Film Noir, Jules Dassin, Twenty Four Frames Favorite Films and tagged A.I. Bezzerides, Barbara Lawrence, Jack Oakie, Jules Dassin, Lee J. Cobb, Millard Mitchell, Richard Conte, Thieves' Highway, Valentina Cortesa. 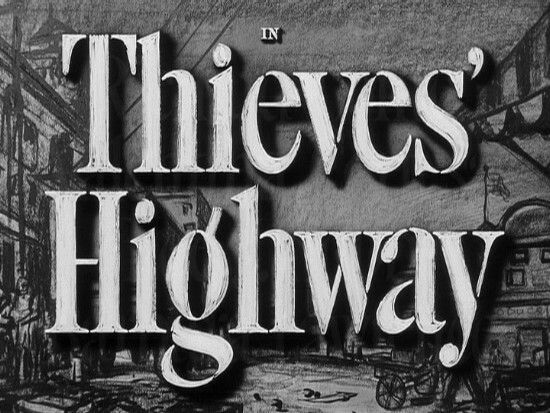 THIEVES’ HIGHWAY is absolutely one of the most memorable of Dassin’s films, and one that straddles the line between social drama and film noir- apoint you deftly deleate throughout this superb revised essay. NIGHT AND THE CITY is his masterpiece of course, but this film, RIFIFI, THE NAKED CITY and BRUTE FORCE among others stand tall in his filmography. Conte, Cortese and Cobb are all excellent and Norbort Brodine’s cinematography is superlative. Alfred Newman’s score is memorable too, and while I would also quibble with the relatively upbeat ending, I’d say it’s on balance a terrific work. Tony d’Ambra commented months back at Dave Hicks’ site that he questions its eligibility as noir, though he wouldn’t disquality it either. 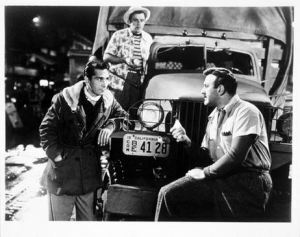 But no matter where it falls, THIEVES HIGHWAY is a mesmerizing film. As for NIGHT AND THE CITY, I am in total agreement with you. At this poing in his career and despite the troubles with the HUAC, Dassin was on a roll with some great films. The film may be borderline noir, it definitely has a nice bleak atmosphere except for the ending which Dassin did not like and I am in agreement with. I would have liked to have seen something darker. Love this one. Just recently was turned onto Dassin this past year. Great stuff. Glad to here this. If you have not seen some of the films Sam mentions in his comment, they are must! Highly recommended all. Thanks!!! 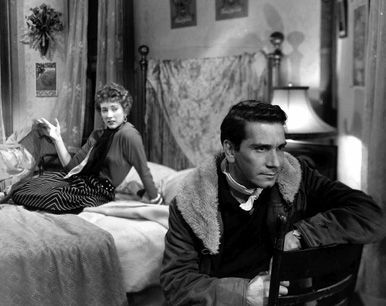 Many critics consider it a noir and one of Dassin’s top films. I found it at a local library. It was released on DVD by Criterion. Hope you can find a copy I do think you will like it. I haven’t seen this one as yet, John, but another great review – sounds like one I would like to track down in the future. A shame about the ending being a cop-out, which so often seems to happen. I do think you would like this Judy. Hope you get a chance to catch it. Thanks as always for the kind words. I really enjoy reading your blog and I wanted you to know that Dawn from, Noir and Chick Flicks has passed the “Liebster Award!”, to Twenty Four Frames. Thank to you very much for the nomination. it is very much appreciated. I tried responding on your blog but I am having trouble posting to anyone on Blogger for the past few days. Not sure why. Anyway, again I appreciate your consideration. 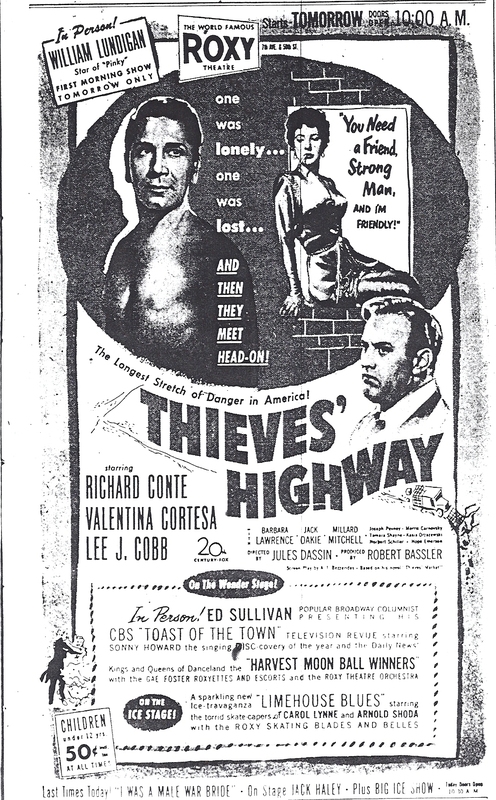 John, as a fan of both Jules Dassin and Richard Conte, I’ve been meaning to catch up with THIEVES’ HIGHWAY for some time. Your review has encouraged me to keep an eye on the Fox Movie Channel (even if it does have a pasted-on happy ending :-)), since it shows up there from time to time. Sounds like those are the deadliest apples since SNOW WHITE! All kidding aside, your terrific review has whet my appetite, so I’ll be making a greater effort to seek out THIEVES’ HIGHWAY.